This Interview with Saw A--- describes issues affecting him in Waw Raw (Win Yay) Township, Dooplaya District, including road construction, bridge construction, education, health, livelihood and land titling. In January 2016, an unknown company stated constructing part of the Asian [National] Highway from B--- village to C--- village. The company manager did not hold any consultation meetings with local people before the road was constructed. The Asian [National] Highway construction destroyed some civilians’ rubber plantations and betel nut plantations in the area between B--- village and C--- village. The plantation owners reported this issue to the local authority, Burma/Myanmar government and the company manager but they have not received any response. Land owners in Kyainseikgyi Township are waiting to access Karen National Union (KNU) land grants after they rejected the Burma/Myanmar government’s plan to measure their land and provide them with land grants. The land owners rejected the Burma/Myanmar government land titling plan because of a lack of discussion before the plan was made. Civilians in A--- village requested that any non-governmental organisation or other organisation working in their village should hold a consultation meeting with the local people before doing a project. The following Interview was conducted by a community member trained by KHRG to monitor local human rights conditions. It was conducted in Dooplaya District on September 5th 2016 and is presented below translated exactly as it was received, save for minor edits for clarity and security. This interview was received along with other information from Dooplaya District, including four other interviews, two situation updates and 164 photographs. People call me Saw A---. Which village do you live? My original village is D--- village but I live in here [B--- village] because I got married [to a B--- villager]. What is the name of this village? This village’s name is B---. I work on a farm and a rubber plantation. Could you tell me how many family members you have? Yes, I can tell you. In total, I have seven family members; in order, I have five children then my wife and I. My youngest child is turning ten years old. How many sons and daughters do you have? I have only two sons and three daughters. What responsibility do you take in the village now? I take the responsibility of a village head. When did you take this responsibility? Could you tell me some of your experiences please? Yes, I can. I started taking this [responsibility of village head] in 2011. I do not have any other special experience except general experience in the village. As we are human, we all have responsibility [for our community] so we cannot refuse it when it is the time for us to take responsibility. However, it depends on the situation [in our village] because we need agreement from everyone by voting when we will do something [to choose a village head]. The person who gets the highest number of votes has to be [the village head]. That person has to take responsibly if anything happens in the village in order to stop [the problem] and to speak to the person [responsible]. How many armed groups are in your village and near to your village? There is only Battalion #16 that is based in our area. Does Battalion #16 come from Kaw Thoo Lei [Karen National Liberation Army (KNLA)] or from another armed group? Has Tatmadaw confiscated any land in this area? No. In 2013 [Noh T’Kaw/Kyainseikgyi Township Burma/Myanmar government] administrators requested Noh T’Kaw Township office [Burma/Myanmar Government Land Record Department] to measure land and provide land grants for the land owners. Based on my opinion, we have our organisation [KNU] so they [Burma/Myanmar government] should hold a meeting [with local people/KNU] and discuss [about which government should provide land grants] before they decide. If everyone agrees with it then we can accept it [Burma/Myanmar government land grant]. Therefore, I met with the former [Noh T’Kaw] Township administrator and [Dooplaya] District administrator U E--- [to discuss] about the above issue. They [he] replied, “If you think we should not accept [the Burma/Myanmar government land grants] yet then you can reject them”. Therefore we decided we would not accept them. Even though they [Noh T’Kaw Township administrators] asked the Burma/Myanmar government [Land Record Department to measure land and provide land grant] for the villagers, we did not accept them. Who requested [Burma/Myanmar government] to measure land and provide land titles? U So Win. He lives in Noh T’Kaw Township. He is part of the Burma/Myanmar government, right? Yes. U So Win is [Noh T’Kaw] Township administrator. Is he the current Township administrator? No. He has retired. Now his duty is in Mandalay region. Have any B--- villagers received a land grant from the Burma/Myanmar government? Or do they have a Karen National Union [KNU] land grant? Could you please tell me if you have information about it? Based on my knowledge, B--- village is located in Kho Ther Pler area [which is controlled by the KNU]. Therefore, there are no villagers from the area between D--- village and B--- village who have received a Burma/Myanmar government land grant. Did they [the Burma/Myanmar government] ask to measure villagers’ land? The Burma/Myanmar Government Land Records Department staff came to my village and notified us that they will measure the land. We did not accept them because some villagers agreed but some villagers did not agree with it. We will accept it [the Burma/Myanmar government land grant] when all villagers agree with it. Then we decided to measure [our lands through] the KNU government because the KNU also has a Land Records Department. 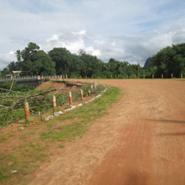 Do you know the name of the road that has been constructed between B--- village to C--- village? This road is called the Asian [National] Highway because it goes to the part [of Asian [National] Highway that has been built]. When did they start constructing this road? They started it in 2013. You mean the month when they started constructing the road and not the month when they measured the road, right? They started constructing this road in Ta Po Tweh [January]. Do you remember the day? No, I do not remember the day. Did the road construction cause any impact [to the civilians]? We [village leaders] noted down the villagers’ rubber plantations and betel nut plantations which were destroyed by the road construction onto our record list and then we reported it to the person in charge of the road constructors. They said they would submit this list [to their upper leaders]. How many victims are B--- villagers? More than ten? Yes, there are more than ten. Some victims lost around 60 rubber trees and there is one victim who lost more than 300 rubber trees. This is the highest number. What is the name of the victim who lost the highest number of rubber trees? His name is U F---. What is the name of the road construction manager? The person who is the highest leader of this road construction? I do not know specifically who constructed this road because people informed us that this road is being constructed by the Mya Lin Aye company chairman. If anything [problem] happens, people [local authorities] have to talk with him but they do not discuss [the problem] with local people. Did they hold any road construction consultation meetings with the villagers before they constructed the vehicle road? Then what actions did the civilians take to defend themselves when the company was constructing the road? Firstly, civilians wanted the local authority to discuss [about options for action and compensation] with them. They requested that the local authority arrange this [compensation] for them in a good way. Later on, civilians were depressed when nobody arranged it for them. They looked back to other villages and they found that those villagers also did not get any compensation [for their land which was affected by the road construction]. Therefore, they did not try [again] to mention anything [to the local authority as they saw that it was unsuccessful in other villages]. At the beginning, they always reported the impacts [of the road construction] to the local authority and talked to the local authority. Do you know the cost of this road and who is managing this road construction project? Or did the civilians request [for this road to be constructed]? Civilians did not request it. If any civilian in our area requested it, some civilians in our village tract would know that. If we want to request [a new road] we will discuss [with all civilians] and we will request it together. I [understand] that someone [who is not from our area] asked for it [the road] but we [civilians] do not know who did it. I do not know how much the cost of the road construction was because the people [who manage the road construction] did not tell us [civilians]. Did the local armed group [KNLA] Battalion #16 and [Win Yay] Township administrator hold any consultation meetings with civilians about the road [construction]? They explained about the impact of the road construction to some relevant civilians but they did not do it with all civilians. Civilians whose lands were affected by the road construction went to them [to report this issue]. They explained about this road construction project to the landowners. They said “This road construction project is not done with money invested by Burma/Myanmar government”. They [villagers] wanted to question about the road construction budget to the upper leaders. They [villagers] said “If this [road construction] project is related to the Japanese Nippon Foundation, maybe the victims will get some compensation”. But they did not say that we will get it for sure. Did the [Win Yay] Township leaders tell you who invested money for this road construction project? No, they did not. Nobody knows who has invested money for this road construction project. Are any local people involved in this road construction project? I do not see any local people involved in the road construction. 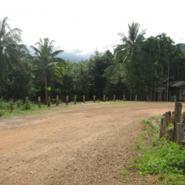 Some people from AE Kyainseikgyi [Township] are involved on this road construction. What does AE stand for? I do not know. There are many types of AE but this [AE’s] name is Thet Naing Oo. This road is from B--- village to C--- village so can you tell me the impact regarding road construction in B--- village and C--- village? All villagers from these villages have suffered [faced] the same [impacts due to the road construction]. Villagers should get some compensation for their loss [of lands and rubber trees]. If they do not get the full amount [of compensation they should get some]. For example, one rubber tree costs 5,000 kyat [US $3.66] but they [rubber plantations owners] will be satisfied even if they get 2,500 kyat [US $1.84] [per rubber tree]. Now, none of them have received any compensation but they just have to accept this. As you mentioned, more than three hundred rubber trees belonging to U F--- were destroyed [by road construction]. How old were these rubber trees? His rubber trees were nine years old because he had looked after those trees for seven years and [those rubber trees] have been producing latex for only two years then they were destroyed by road constructors. After they [road constructors] destroyed villagers’ rubber trees, have there been any difficulties [impacts] for villagers’ family livelihoods? Do you mean for U F--- and other villagers, right? They work on plain farms for their livelihood. Everyone has problems. What are the negative consequences of this impact to the rubber tree owners? How do they feel regarding their rubber trees being destroyed [by the road construction]? How do they solve their livelihood problems? As I mentioned above, they will be fine if people [from the construction company and local authority] have a meeting with them and talk about compensation for them. U F--- is the nephew of [Dooplaya] District administrator U E---. Do the victims have any kind of land grant? They do not have land grants but they have yearly land receipts [to show that they have paid land tax]. They do not have the specific acreage of their land because they never measured it. They still use the way that our great grandparents used to use in the past so they do not have the specific number of acres of their land. The Burma/Myanmar Government uses the acre measurement for land. The villagers measure the size of their lands by the number of the baskets of rice seed that they can plant on their farm. For example, my father could plant ten baskets of paddy seed on this farm in the past. Then this is how they measure their land. They have not measured it systematically. Do you know of any other expenses [caused by the road construction] in B--- village? Are there any villagers who will get compensation for their loss? No. An old man got compensation for his rubber plantation and betel nut plantation which were destroyed by Burma/Myanmar government bridge construction project workers. His rubber plantation and betel nut plantation were located besides the river, and at the curve of the river. They [bridge constructors] changed the [bridge location] and constructed the bridge [on his plantations] so this affected his land. We [village leaders] tried to ask for compensation [to the Burma/Myanmar government bridge construction staff] for him and then he got compensation for his affected land. How wide was his land and how many [rubber trees and betel nut tress] were destroyed? In total, he planted more than three hundred rubber trees and betel nuts trees [on his land]. How did he request the compensation and how much did he get? At first, the Burma/Myanmar [bridge construction project] workers did not care about us when we requested [the compensation for the impact of the bridge construction]. This old man does not like to argue [with other people] and he obeys the rules [of the village]. He is old and he cannot rely on his children because his children have [to look after] their own family. Five or six years ago, one rubber tree cost around 10,000 kyat [US $7.36]. We [village leaders and victims] did not ask for compensation based on the full value of trees [rubber trees and betel nut trees] that were destroyed because we felt satisfied if we could get half of the total compensation. We got [the land owner] compensation money of 5,000,000 kyat [US $3678.15]. How old were those rubber trees? Were they mature enough to produce latex yet? [The owner] started tapping [those rubber trees] not long before. The rubber plants were only nine years old. What is the name of this Dtee [uncle]? His name is U G---. How did he get this money [compensation]? Did he go to the [Township] office to get the money or did the village leaders get it? The [Burma/Myanmar Win Yay Township administrator] himself brought it to B--- [village]. He [U G---] got compensation for his loss but the other people like U F--- who lost their land] did not get any compensation. Therefore how do those people feel? At first, they were unhappy about U G--- [getting compensation] alone. They said “If it is raining, it has to rain everywhere. Now it is raining just on U G--- so it makes us unhappy [because we feel that it is not fair]”. We [village leaders] think about their feelings. Later, we had a meeting with [Win Yay Burma/Myanmar] Township administrator and discussed about what we had to do about these [villagers] impacted [by the road construction project]. We asked him to help us and give us some advice. He reported it to his department [in the Burma/Myanmar government] too but people [with authority] said we could not get compensation. Therefore, we cannot do anything now. What is U Ta Pay doing now? Does he still act in the position of the company chairman or has he retired? His company does not do anything but he still has his position. He has never retired. Will [the company] upgrade this road and widen this road in the future? We heard from people who know about the [road construction] contract say that they will pave the road with stone this coming summer. Have they made any further plans for this road construction? Yes, they will pave this road with stone and cement. Can you tell me the situation of this road construction and the situation of the civilians in this area regarding their social and cultural understanding? The civilians in my area are Buddhist. There are no Christians in my area. We had one Christian household in the past but we do not see [know] where they are now. We work on farms for our livelihood but everyone has problems. Sometimes we face difficulties with our work. Some civilians come to us [as village leaders] and ask for advice about what to do for their livelihoods. We cannot help them [much] because we have to work very hard for our family and we just try to help each other as much as we can. How many widows and orphans are there in your village? How many children are there who are not able to go to school? We reported the name list [of widows and orphans] to Tharamu Pah Doh [female principal]. Most of the children in my village are going to school but there are a few children who are not able to go to school. We [village leaders] hold meetings before the school opening ceremony takes place, then, for the children who are not able to go to school, we support them [to go to school]. The Burma/Myanmar government provides one school uniform set per student and the students get free books. We go to the houses of the children who do not go to school and we talk with their parents [and inform them] that we can provide for the school expenses for the children who are not able to go to school. If there are ten children in the village who are unable to go to school then we support them to go to school. We prioritise education [for the children]. Do the students in your village have to pay school fees? [Actually] They do not have to pay school fees. Standard Ten is the most important so village leaders and students’ guardians pay a tuition teacher [for private classes] so that the Standard Ten students will pass their exam with distinction. It costs money for paying teachers [for private classes]. Which [government] school system is the school registered under? Burma/Myanmar government or Karen National Union [KNU]? 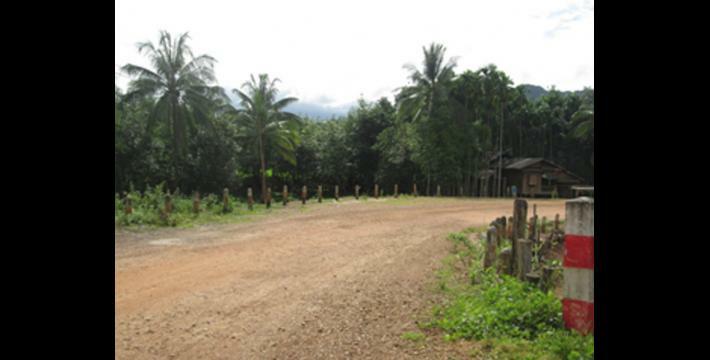 The school is registered under the Burma/Myanmar government. What standard is the school up to? This school is up to Standard Ten. We also have a high school in [B---] village and a middle school which combines with primary school #2 at H--- [village], and another primary school at I--- [village]. Are the teachers of B--- high school from the village or from Burma/Myanmar government? They are all Burma/Myanmar government teachers. How much salary do the teachers earn per month? They earn 200,000 kyat [US $147.12] per month. Are there any armed groups that disrupt the students when they study in school? Can the students study in peace? Yes, they can study in peace. Who provides books and pencils for the students? UNICEF [United Nations Children's Fund] provides note books, pens, pencils and erasers for the students. They delivered the school stationary by car. Do the students get free [education] up to Standard Ten? As I mentioned above, they can study for free [up to Standard Ten] but the students have to pay for a study book that we call ‘Guidelines’. The students do not get these kinds of books for free. Can the students study Poe Karen or S’ Kaw Karen language? How many standards can the students study Karen language up to, and how many classes can they study Karen language in? The students can study Karen language for one class (hour) per day. Which standard do they study Karen up to? They can study Karen from Standard Four to Standard Ten. What is the main job that the civilians do in this area to work for their livelihood? Most civilians work on plantations. What kind of plantations do they work on? Sesame plantations and rubber plantations. Do you want to add more information that I have not asked you? Regarding the impact of the road construction, we want any groups or organisations that plan to do anything in our area to come and discuss with us [first]. Then we will consider their request to us and we will accept [only] the requests that we choose to. Another thing, I just heard people say that the community based projects and the Mya Sein Yaung Project are supported by foreign countries so I want to know more about these projects. Therefore the Burma/Government and the project leaders should discuss with us [villagers and villager leaders] before they send their staff to work in our area. If we see [that projects] can provide any advantage to the civilians then we will accept them but we will not allow them if they do not provide any advantage for us. Some NGOs or what-O came into our village without informing us of anything [beforehand] and they do whatever they want in a careless way. We hope that this one [type of NGO] will not be here because we do not want it. Do you have clinic in your village? Who registered [and supports] this clinic? Did the Burma/Myanmar government, KNU or civilians set up this clinic? Do you have enough medicine [at the clinic]? If not, where do the villagers have to get medicine? There are some medicines at the clinic but it is not enough compared to in a hospital. Where do villagers get medicine from when they have an illness? Do they have to buy it from the pharmacy or they get it for free from the clinic? It is free to get medicine from the clinic. How about medical injections like saline [intravenous drip]? They provide oral medicine for free, not injections. How much does one saline [intravenous drip] cost? I do not know because I did not ask Tharamu [nurse]. Do you want to say [report] any more information? You can add more if you have it. No. That is all that I want to report. The Asian Highway Network is a United Nations Economic and Social Council for Asia and the Pacific-supported project that aims to link 32 countries in Asia across 141,000 kilometres of roadway. In Burma/Myanmar the project has involved land confiscation and forced labour. 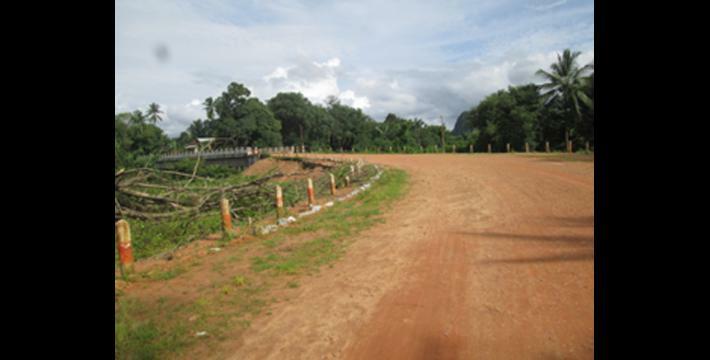 For more information about the Asian Highway Network, see “Beautiful Words, Ugly Actions:The Asian Highway in Karen State, Burma”, KHRG, August 2016; “The Asia Highway: Planned Eindu to Kawkareik Town road construction threatens villagers’ livelihoods,” KHRG, March 2015; “‘With only our voices, what can we do?’: Land confiscation and local response in southeast Myanmar,” KHRG, June 2015; “Tollgates upon tollgates: En route with extortion along the Asian Highway,” KHRG, October 2009; and “Development by Decree: The politics of poverty and control in Karen State,” KHRG, April 2007. In addition, fighting continues erupting between the Tatmadaw and the DKBA along the highway, with the latest clash erupting in early July 2015, resulting in the highway between Myawaddy and Kawkareik shutting down for several days, “DKBA, Tatmadaw fight over illegal highway tolls,” Myanmar Times, July 3rd 2015. All conversion estimates for the kyat in this report are based on the March 3rd 2017 official market rate of 1359 kyat to US $1.